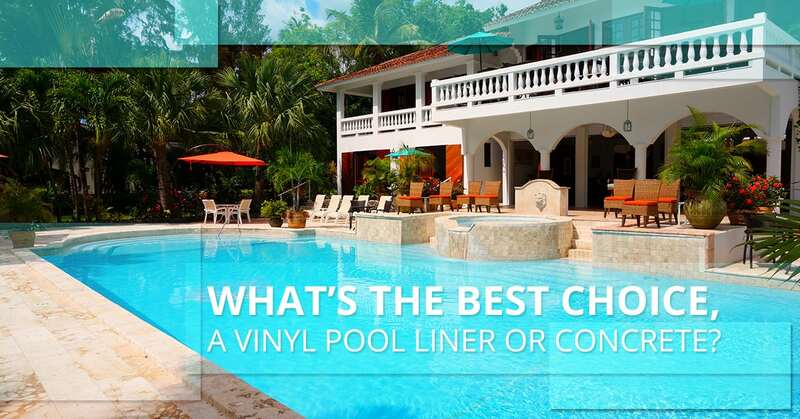 What’s The Best Choice, a Vinyl Pool Liner or Concrete? Are you considering a new backyard pool for your family? Congratulations! We know from experience that a family pool can mean years of family fun. We also know that it is a big investment and decision that no one should take lightly. Do your research and make the best choice for your family. Of course, we think vinyl pools are great. But there are other good options too. Your decision will be made based on your priorities, not on what some pool installer tells you. That’s how it should be. With that in mind, we’ve put together a comparison for you between vinyl-lined pools and Gunite, or concrete, pools. What is a Vinyl-Lined Pool? Pools with vinyl liners are built with a steel-wall structure. That durable structure is covered with a high vinyl. The liners are available in an almost limitless number of styles that very effectively mimic the look of stone, tile and other materials, all while remaining smooth and appealing to touch. They’ve been around for more than 60 years, and improvements in technology and manufacturing processes have made them very durable, and extremely easy to maintain and repair. People used to consider these the low-cost option and expect lower quality to come with that cost savings. But these days, the low cost does not mean lower quality, it just means a different set of features when compared to other types of pools. Why Should I Choose a Vinyl Pool? You want a semi-custom pool shape: The steel structures for vinyl-lined pools are manufactured to certain specifications, but can be configured in many different ways, allowing you to achieve a wide variety of shapes, depths, and to add other custom features. You don’t want to spend an arm and a leg: A high-quality vinyl pool can cost up to $10,000 less than other types of pools. And, because of recent advances in technology, the quality of construction is comparable. You want a low-maintenance pool: Vinyl liners are non-porous and resistant to algae and bacterial growth that you’ll have a harder time managing with other types of pools. You realize that a vinyl liner won’t last forever: You should typically expect to have to replace a vinyl liner every 15 years or so. However, even with the cost of replacing a liner, the overall lifetime cost of ownership for a vinyl pool can still be still lower than other types of pools. Gunite pools are built with a rebar frame that is sprayed with an extremely hard-drying mixture of concrete and sand. There are other ways to install concrete pools, including building wooden framed pools with poured concrete. But we aren’t going to cover those here. Gunite is the most common type of residential concrete pool installation. Gunite pools can be customized with waterfalls and other custom features. They are very versatile and allow homeowners to customize their pool shape in an almost unlimited number of ways. Why Should I Choose a Gunite Pool? You want an ultra-customized pool: You’ve got money to burn and you want to customize your pool so the only thing more impressive is the water park. You don’t mind waiting a long time for your pool to be ready for swimming: Gunite pools take about twice as long to install as vinyl pools. You want a gigantic pool: If you want a very, very large pool, you’ll want to go with gunite. Steel-walled pools aren’t practical for very large pools. You understand that maintenance costs are higher: It takes more effort, and more chemicals to keep a gunite pool clear and healthy. Resurfacing a gunite pool after 20-to-30 years is also much more expensive than re-lining a vinyl pool. Is there a head-to-head comparison? Here’s a direct comparison of some of the most important differences between vinyl and Gunite. Keep in mind that vinyl pool liners score higher on many things, but if the things that you think are the most important to you score higher in the Gunite column, you’ll have some thinking to do about what the best option really is for your family. From our perspective, for a residential pool you can’t go wrong with a vinyl pool liner. If your pool is going to see as much action, and be subject to as much potential damage as a public pool, then you might want to consider Gunite. Give us a call and let’s talk about what you want for your new pool. We’re here to help you make the right choice for your family.